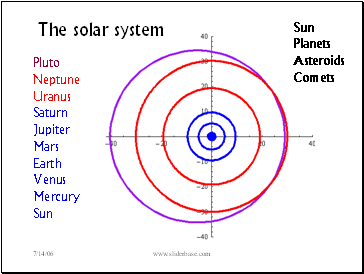 Ptolemy – the geocentric model, that the Earth is at rest at the center of the Universe. 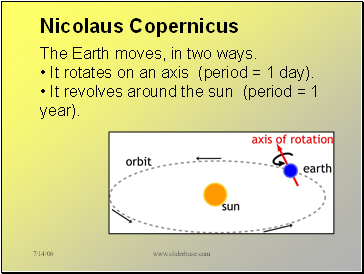 Copernicus – published the heliocentric model. 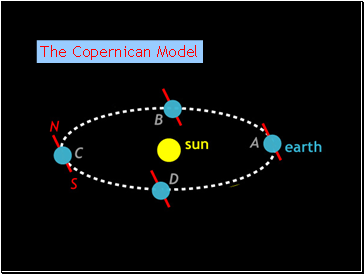 Kepler – deduced empirical laws of planetary motion from Tycho’s observations of planetary positions. 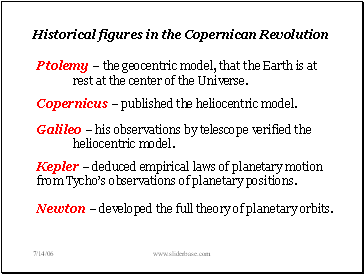 Newton – developed the full theory of planetary orbits. 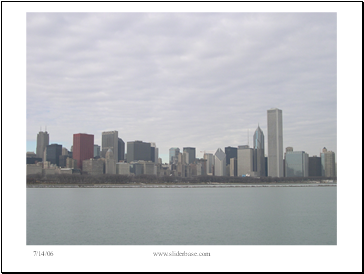 The Earth moves, in two ways. 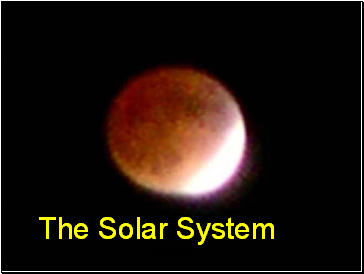 It rotates on an axis (period = 1 day). 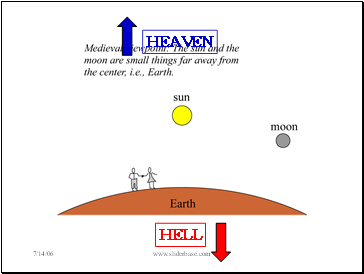 It revolves around the sun (period = 1 year). 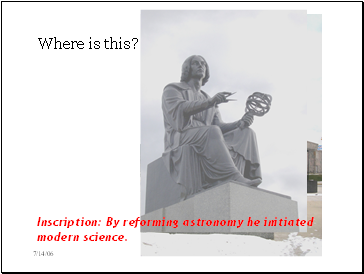 Inscription: By reforming astronomy he initiated modern science. 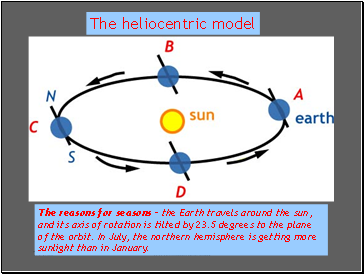 The reasons for seasons – the Earth travels around the sun, and its axis of rotation is tilted by 23.5 degrees to the plane of the orbit. 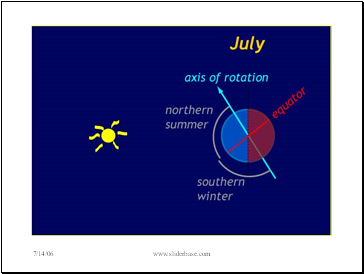 In July, the northern hemisphere is getting more sunlight than in January. 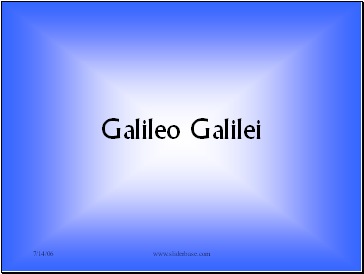 Galileo did not invent the telescope, but when he heard about the invention he figured out how to build telescopes. 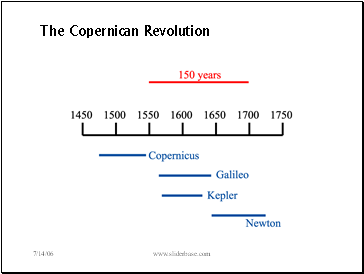 He had the best telescopes of his time. 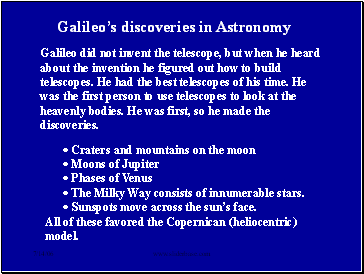 He was the first person to use telescopes to look at the heavenly bodies. He was first, so he made the discoveries.